RAJKOT: A 25-year-old man was attacked by a leopard in the wee hours of Thursday while he was sleeping in an open field in Fareda village of Gir-Gadhda taluka of Gir-Somanath district. He was admitted to Junagadh civil hospital after treatment in Gir-Gadhda primary health centre. According to forest officials, Raju Ghelabhai Jadav, resident of Fareda village, was attacked by the leopard when he was sleeping in the farm of Dilip Parmar. 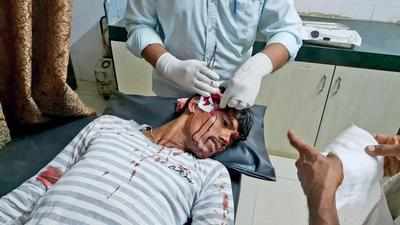 Jadav suffered injuries on his head and cheek. Another person who was sleeping besides Jadav woke up on hearing his cries and started throwing stones at the leopard to drive it away. Jadav was first taken to the primary health centre in Gir Gadhdhda and later to Junagadh civil hospital for further treatment. Forest officials have set up cages at various places in the village to nab the leopard. Attack on humans by leopards have become frequent in Gir-Somnath and Junagadh districts. In April, a five-year-old girl was killed in Sutraparad in a leopard attack. According to the forest department, between April 2017 and March 2018, nearly 110 leopard attacks have been reported from Gir-Somnath, Junagadh and Amreli districts.